Tesla’s retail model, which is direct-to-customer, allows for future owners to customise the design of their vehicle and be educated on the benefits of owning an electric vehicle. Tesla has opened its ﬁrst New Zealand store and service centre in Auckland as part of the global expansion of stores and service centres across the globe. Located at 501 Karangahape Road, the store will host three vehicles, made up of two award-winning Model S and a Model X, in addition to a signature Tesla ‘skateboard’ chassis, Tesla Powerwall and six Supercharging bays. Customers will also be able to view the Tesla home energy product offering, which includes solar panels and Powerwall, a home battery system, which stores excess solar energy for use even after the sun has set. Powerwall is a simple ﬂoor or wall mounted system. Heath Walker, Tesla senior manager of marketing and communications for Australia and New Zealand, says that Tesla’s retail model, which is direct-tocustomer, allows for future owners to customise the design of their vehicle and be educated on the beneﬁts of owning an electric vehicle. Tesla’s servicing model on offer at the store is also unique, built on a zero-proﬁt model, ensuring owners receive a full understanding of the costs and works being undertaken on their vehicle upfront and on occasion even prior to arrival at the service centre due to remote diagnosis over the air through the vehicle’s in-built connection. Heath says that within hours updates can be made across the entire customer ﬂeet resulting in a car that is constantly evolving and improving. He says that 90% of the time Tesla can remotely diagnose an issue and what is needed to repair it. In addition to the Auckland store’s Superchargers, Tesla is expanding its Supercharger network with newly opened sites in Queenstown and Omarama. Heath says that this furthers the investment of electric vehicle infrastructure in New Zealand with Tesla owners already beneﬁ tting from Destination Chargers in more than 75 locations nationally including shopping centres, secure parking locations, hotels, restaurants and resorts. 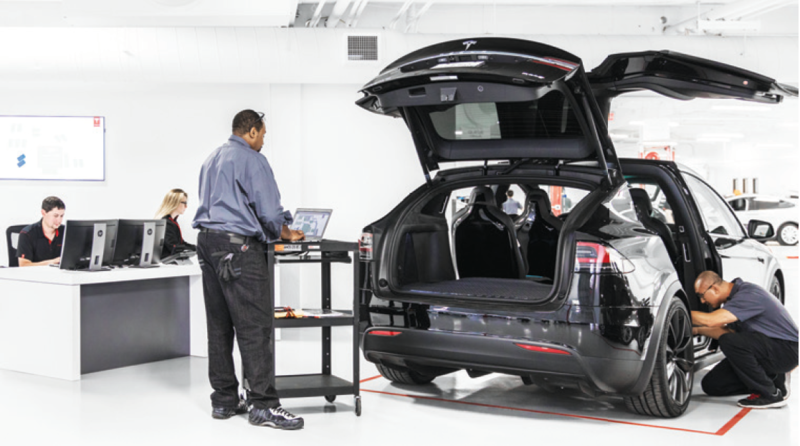 Tesla’s servicing model on offer at the store is also unique, built on a zero-profit model, ensuring owners receive a full understanding of the costs and works being undertaken on their vehicle upfront. This gives customers the ability to quick charge, allowing easy long-distance travel long along welltravelled highways around the world. Heath says that the Tesla Supercharger is substantially more powerful than any existing charging technology, providing up to 120 kilowatts of power and 270km of range in 30 minutes. “Supercharger stations are strategically placed to allow owners to drive from station to station with minimal stops. “Stations are located near amenities like roadside cafes, and shopping centres so road trippers can stop for a quick meal and have their Model S and Model X charged by the time they’re done. Heath says that Tesla continues to grow its presence in New Zealand, working towards its mission to accelerate the world’s transition to sustainable energy.